Deputy Eugene Murphy pictured with pupils from Cloonfour NS during the raising of the Active Schools flag and their second Green Schools flag. Cloonfour National School raised not one, but two new flags at a special ceremony in the school on Friday, June 22. It was a memorable occasion where a large crowd of pupils, parents, friends and families gathered to celebrate the school raising their first Active Schools flag and their second Green Schools flag. Ciara Kearney, principal Cloonfour NS, acknowledged the vast amount of work undertaken by both the Active Schools committee and the Green Schools committee and congratulated everyone on their hard work. Various dignitaries attended the ceremony: Eugene Murphy TD, Senator Maura Hopkins and the Roscommon Rose Eimear Reynolds. Deputy Murphy praised the school on their great achievement and spoke to the crowd about the importance of preserving our environment and the benefits of keeping fit and healthy. Eimear Reynolds reflected on her own school days and told the children how envious she was of them and how she would love to be back at school enjoying all these fun activities. 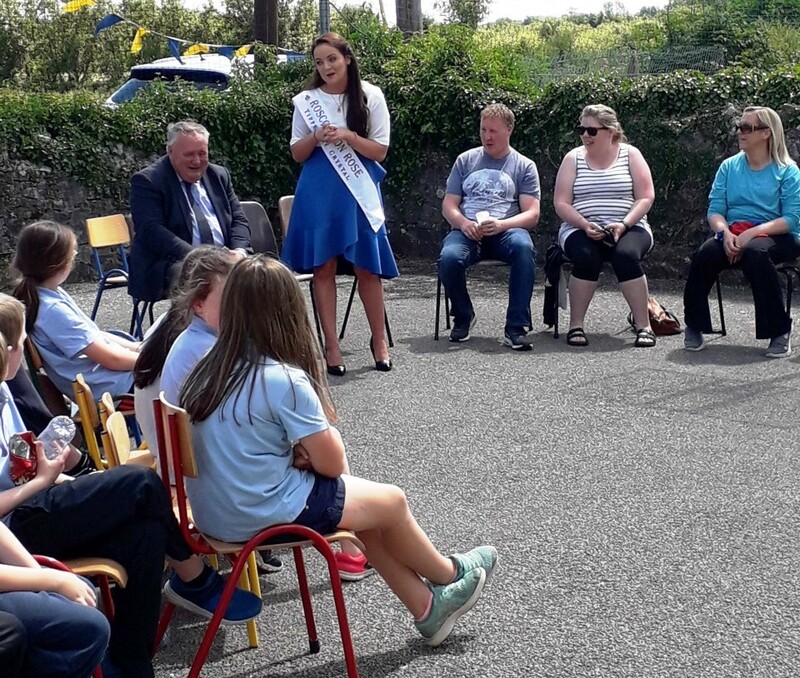 Photo caption: Roscommon Rose Eimear Reynolds speaking at Cloonfour NS during the raising of the Active Schools flag and their second Green Schools flag. The school also hosted an Ice Cream party in aid of Down Syndrome Ireland and raised much needed funds for the charity. Cloonfour NS is located between Tarmonbarry and Rooskey and is still accepting enrolment for September.